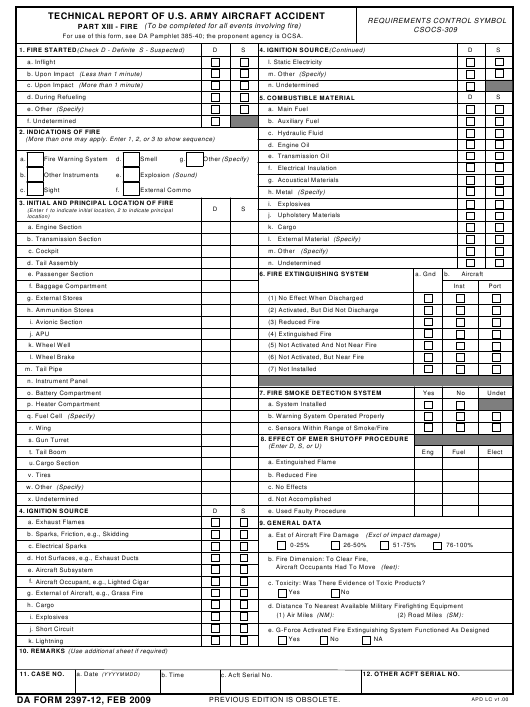 DA Form 2397-12 - also known as the "Technical Report Of U.s. Army Aircraft Accident, Part Xiii - Fire" - is a United States Military form issued by the Department of the Army. The form - often mistakenly referred to as the DD form 2397-12 - was last revised on February 1, 2009. Download an up-to-date fillable PDF version of the DA 2397-12 down below or look it up on the Army Publishing Directorate website. For use of this form, see DA Pamphlet 385-40; the proponent agency is OCSA. c. Toxicity: Was There Evidence of Toxic Products? 12. OTHER ACFT SERIAL NO.